Please check latest updates at the end of the article. In my previous post I was talking about new 2010 Office Data Connectivity Components, or Microsoft.ACE.OLEDB.14.0. I have a small sample there how to programmatically access SharePoint 2007 data using this component. While this approach works great when you are building any custom solution, there is also a way to use these components without any coding at all. Microsoft.ACE.OLEDB.14.0 can be used in Excel Services, working around its limitation on SharePoint data sources. For instance this could be used to create Excel Charts and Pivot tables, based on SharePoint data source. This solution tested on SharePoint 2007 Server (MOSS) and Microsoft Office 2007. You will need 2010 Office Data Connectivity Components installed on your SharePoint 2007 / Excel Services machine. Do not forget to go to Central Admin -> Shared Services -> Trusted Data Providers -> add it up there as Provider ID = "Microsoft.ACE.OLEDB.12.0" and Provider Type = "OLE DB". We can't use Microsoft.ACE.OLEDB.14.0 directly from Excel, data connection wizard will fail to create Data Link. But we still can create our own Office Data Connection (ODC) file. Instead of "Provider=Microsoft.ACE.OLEDB.14.0" we have to use "Provider=Microsoft.ACE.OLEDB.12.0". It's a bug and would be probably fixed in release. Save file with .odc extension and try opening it in Microsoft Excel. If everything is right, you should get your data loaded in Excel. 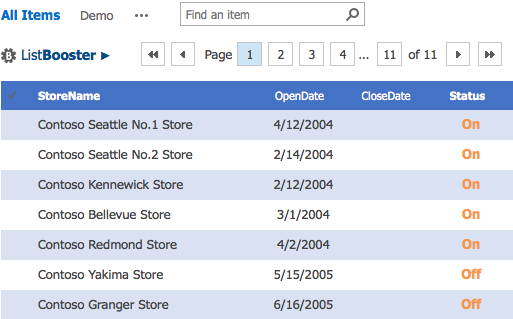 Save your .odc file in Data Connection Library in SharePoint 2007 (MOSS). Approve it, or ask owner of the site (administrator) to approve it. It will still work for you without the approval, but not for the other users. Create a new Excel Workbook, under Insert tab select PivotChart (or PivotTable). In the "Create PivotTable with PivotChart" dialog select "Use an external data source" and click on "Choose connection button". Click "Browse for more" and navigate to your .odc file in SharePoint Data Connection Library. Build up your Pivot Chart or Pivot Table. When you are done, click on Office Button and select Publish -> Excel Services. Browse to your target SharePoint document library. Click "Excel Services Options" button and select what items do you want to publish using Excel Services. Save the file. Now you should be able to access your pivot table or pivot chart using Excel Web Access Web Part. That charts/table are totally dynamic and will show your updated data when refreshed. After some additional research and help from Ivan Huter looks like described method works with standalone MOSS installation only. You will have to configure Kerberos Authentification in order to make it working in a farm. Unfortunately I do not have time right now to test Kerberos option, but I will post an update when I get a chance. Let me know if you have any questions or notes.